When a freely suspended parallel plate capacitor is charged at high voltage, it turns "spontaneously" so as to minimize its total energy, and seek a stable position parallel to the direction of the motion of the earth in the aether (the Zero Point Field). 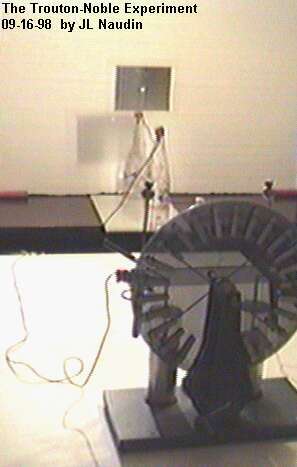 The Trouton Noble (1) experiment is generally regarded as the electrostatic equivalent of the Michelson-Morley optical experiment: it looks for an effect predicted to be caused by the absolute motion of the Earth through the ether. If a parallel plate capacitor is suspended by means of a fine torsion fibber and charged, an electromagnetic torque is expected due to magnetic forces since the capacitor is moving through the ether. Specifically, the torque should be where Q is the charge of the capacitor, D the distance between the capacitor plates, U the velocity of the capacitor carried along by the Earth in its absolute motion in space, q the angle between the velocity vector and the normal to the capacitor plates and j the angle between the velocity vector and the fibber. 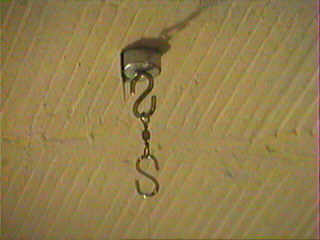 The original Trouton-Noble experiment looked for the effect due to the orbital velocity U = 3x106 cm/s of Earth about the Sun. It found a null result. 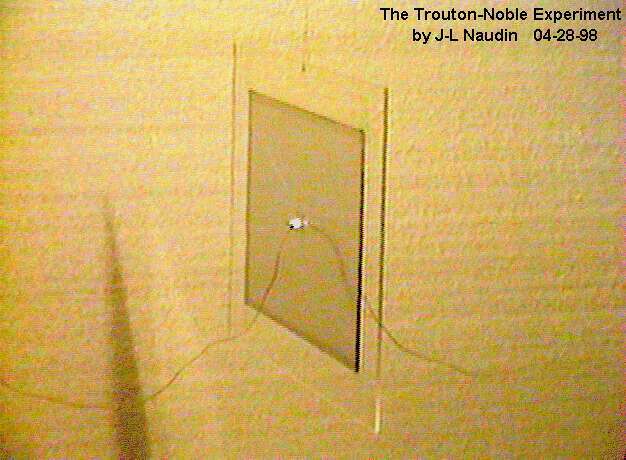 However, Chase (2) identified experimental problems making the original Trouton-Noble null result inconclusive. Chase repeated the experiment without the identified sources of error, and found the same null result. 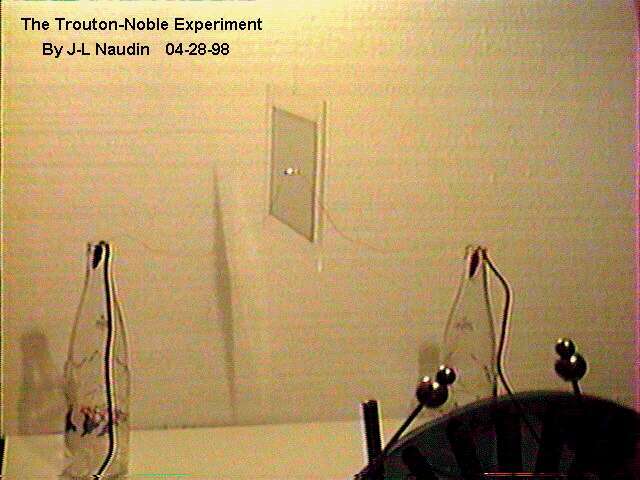 More recently, Hayden (3) designed an experiment which is 105 times more sensitive than the original Trouton-Noble experiment, and that also yielded a null result. There is a fallacy in the usual reasoning about the Trouton-Noble experiment. It is wrong to neglect the torque due to the forces exerted by the insulating separators necessary to keep the plates from approaching each other under their mutual electric attraction. Therefore the torque must not be obtained by calculating the interaction between the charges of the plates which face one another, but instead by calculating the interaction between the charges of the plates symmetric with respect to the axis of symmetry of the capacitor as shown in Fig.1. For a symmetric and homogeneous distribution of charges on the plates, the total torque must be zero at low voltage. Thus the capacitor is in equilibrium under both the electromagnetic and the mechanical forces of constraint exerted by the rods for all orientations of the capacitor. Hayden (4) recently offered an analysis of the Trouton-Noble experiment in which he concluded that it is not competent to decide about the existence of the luminiferous ether. But I will argue here that the Trouton-Noble effect can indeed be observed, under the proper conditions. As discussed in recent papers (5-14), any stimulated motion either rectilinear or rotational of a charged capacitor located in the Earth's reference frame is a consequence of the violation of Newton's third principle. We can show that the effect is small or zero if the charges on the surfaces of the plates are the only charges which participate to the effect. However, the charges inside the plates can give a more important contribution to the predicted effect provided one uses a voltage higher than 40 kV. 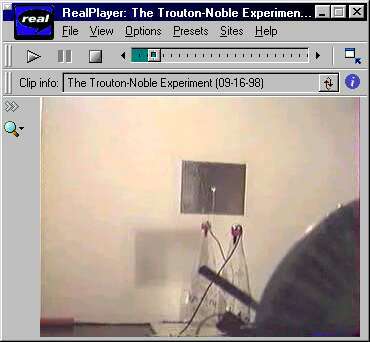 Therefore, the Trouton-Noble experiment previously failed because the voltages of 2 or 0.6 kV used in the experiments were too small and also because there is no leakage current in the capacitor which is necessary to increase the magnitude of the stimulated rotation. An experiment showing the linear stimulated motion of the capacitor through the ether has been reported elsewhere (7,9,11,13). However, we would like to report that the stimulated rotation of a parallel plate capacitor has also been observed. 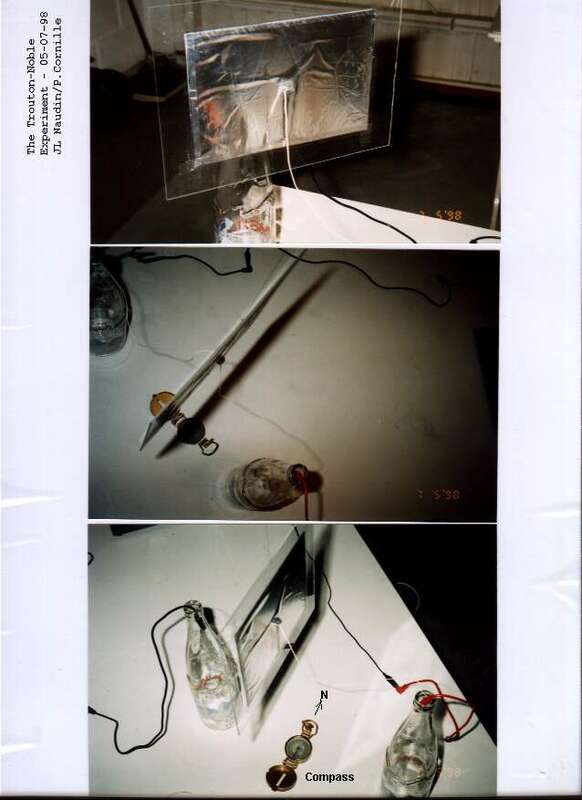 The parallel plate capacitor was obtained by sticking two thin aluminum foils to an insulating plate which was suspended by a thin wire to the ceiling of the laboratory. As soon as the voltage increases, one can see the torque effect. 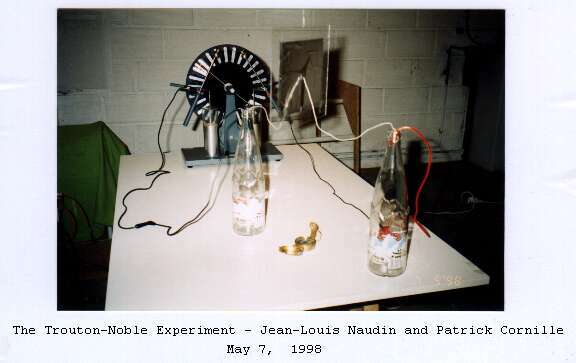 Notes: The successfull replication of the Trouton-Noble experiment conducted by Jean-Louis Naudin and Patrick Cornille has been presented during the "Physical Interpretations of Relativity Theory - VI conference" at the Imperial college in London (UK) on September 12th, 1998.